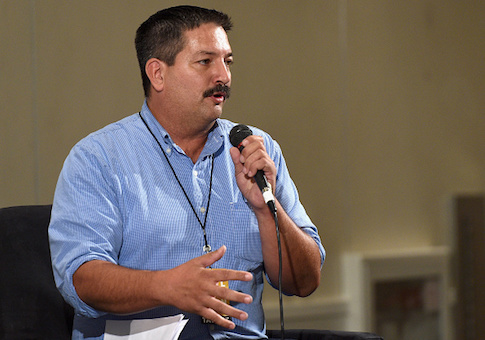 Randy Bryce, a Wisconsin Democrat running for the seat currently held by Speaker of the House Paul Ryan (R., Wis.), claimed last week he wasn't a politician, but this is the fourth time he has run for public office. The Pulitzer Prize-winning fact-checking website PolitiFact ruled Tuesday that Bryce's claim was "most false" since he has now run for public office four times in the last six years. Bryce made the comment during the May 6 episode of Showtime's "The Circus." Co-host Mark McKinnon asked Bryce whether he was a politician, prompting the candidate to say, "No, and I think that's what people like." While Bryce is seen as a newcomer on the national stage, he previously ran for three different offices–including two partisan offices–over the span of just over two years. Bryce lost by 40 points in the Democratic primary for an open seat in the Wisconsin Assembly in August 2012. He then ran for the Racine Unified School Board in February 2013, where he was one of four candidates that were eliminated. In November 2014, Bryce then lost by over 21 points in the general election for an open state Senate seat. Mordecai Lee, a University of Wisconsin-Milwaukee political science professor and former Democratic state lawmaker, believes Bryce is more like "a wanna-be politician" than an actual politician. Political Wire publisher Taegan Goddard, however, believes there is a stronger argument that he is a politician. "If you continue to run, you’re spending a decent amount of effort trying to win public office — you’re a politician in that case," he said, adding, "If you’re going to spend that much time running for a congressional seat, that is a full-time job." The National Republican Congressional Committee said Bryce has continued to lose elections because voters see through his "phony character." "Randy Bryce already suffered three humiliating defeats because Wisconsin voters see right through the phony character he’s created. By the end of 2018, it will be four," NRCC regional press secretary Chris Martin told the Washington Free Beacon. PolitiFact went on to say Bryce's claim that he is not a politician "verges on disingenuous." Indeed, for Bryce to flatly reject the label of politician as he did on Showtime, verges on disingenuous. In the eyes of a typical ironworker who has never run for public office, Bryce’s four runs might make him look very much like a politician. And he hasn’t been working the iron during 2018, his campaign told us, as he runs full time for Ryan’s seat. The ironworker and candidate for Ryan’s U.S. House seat has not been elected to public office and has not held a government position. And there is no universal definition of politician. But Bryce, who is active in the Democratic Party, is making his fourth run for public office in the past six years. And his current run is by far the most involved — as the nearly $5 million he has raised, his national endorsements and leaving his job to campaign full time would attest. Bryce’s statement has some element of truth but is misleading. We rate it Mostly False. This entry was posted in Politics and tagged 2018 Election, Paul Ryan, Politifact, Randy Bryce, Wisconsin. Bookmark the permalink.